Here's an updated look at how each team stands in terms of their 2015 salary cap. As the official team salary cap has not yet been reported by the league, we'll continue to use the rumored $142 million to project space for each team. We'll show a thorough breakdown of each team's financial situation heading into March. Keep scrolling down for a brief analysis of each team, including potential early offseason moves. 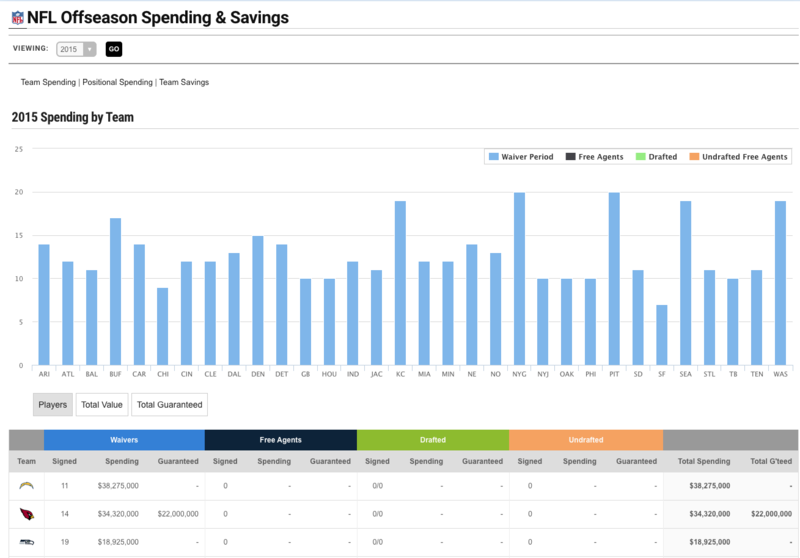 In addition to our cap projections, we've launched a new tool that will track the spendings and savings of each NFL team in real-time. The tool covers Waiver Spending, Free Agent Signings, Draft Signings, Undrafted Free Agent Signings both by Team and by Position. In addition we'll show cap savings that accrue for Releases, Restructures, Trades, and Retirements. The total number of free agents a team currently carries, including the amount of Unrestricted Free Agents in parenthesis. (Click this to load the complete list). These figures represent the estimated unused cap dollars each team is currently able to rollover from their 2014 roster. The Rams are currently the only team without available rollover money. The league-provided adjustment based on factors from last year's cap. The number of players currently with a 2015 contract. The combined cap total for the 51 largest contracts on a team's roster. Teams will be expected to get this figure under the finalized cap figure by March 10, 2015 (4PM EST). For now we're estimating that figure to be $142 million. The maximum amount of estimated cap dollars a team will need to spend to sign all of their upcoming 2015 draft picks (assuming the rookie scale mimics the 2014 scale, though it may increase slightly if the overall team cap rises more than expected). The estimated amount of space a team currently has to work with when subtracting the projected $142,000,000 + the est. 2014 rollover + the est. maximum draft pool from their Top 51 Cap $. The Cardinals cleared $12.75M with the restructured extension for WR Larry Fitzgerald, and now have more than $5M in space per our estimates. DL Darnell Dockett should be the next order of business in helping to clear cap space. Atlanta sits in nice shape heading towards the free agent period, with more than $22.6M currently available. They can add another $3.75M to that by releasing RB Steven Jackson, one of a few expected cap casualties this offseason. With just $2.78Min estimated space, Baltimore will be making noise in the coming weeks. LB Arthur Brown, and DE Chris Canty are among the early bubble players, and would clear a combined $3.75M in 2015 space. The Bills can use plenty of their $30.4M+ in estimated cap space to make up for their lost 1st round pick in free agency this offseason and appear to be starting their offseason by trying to lock down pending free agent pass-rusher Jerry Hughes, and RB C.J. Spiller. They're execpted to be actively seeking offensive linemen, defensive backs, and maybe even a free agent QB. The Panthers stand at a healthy $13.8M in space after a few minor moves, and appear poised to add to that by releasing 9-year RB DeAngelo Williams. They'll likely designate the move a Post -June 1st release, clearing $2M in space (but cannot officially do so until March 10th). The Bears need a new defense, and have a $5.7M draft pool, and $23.7M in current cap space to do so. Current QB contract withstanding, it's a big offseason for the new regime in Chicago. The Bengals are actually in a pretty nice spot in terms of space ($35M), and parting free agents (14). Overall the Cincinnati defense underachieved in 2014, and DE Robert Geathers might become a casualty of it. Doing so would clear $3.05M more in cap space. The Browns are a bit of a mess. Their starting QB is about to hit free agency. Their 2014 1st round-selected QB can't stay out of the bars. Their top offensive weapon in WR Josh Gordon is facing a suspension for the entire 2015 season. Silver lining: Cleveland holds two first round picks, and more than $50M in projected cap space. The Cowboys hold two of the more notable free agents in WR Dez Bryant and RB DeMarco Murray. With a little under $15M in est. space to work with as of today, it's unlikely they'll get both back in the fold next year. Restructuring the contract of Tony Romo seems likely. The Broncos have 7 2014 starters set to hit free agency. While they currently possess north of $26M in cap space, it seems unlikely that all will return, especially with the use of the franchise tag (likely to Demaryius Thomas). 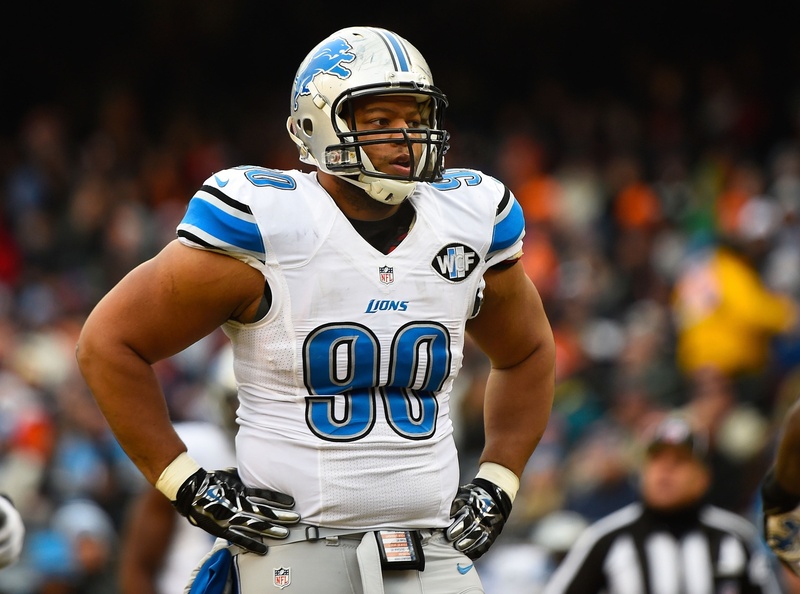 No team has a bigger (and costlier) decision to make this offseason than the Lions do with DT Ndamukong Suh. With just over $15M in space, they'll need to clear space to have a chance to keep him in the fold. After nearly finding themselves in the Super Bowl, the Packers are in excellent shape heading into the offseason, carrying more than $27M in space. Notable free agents include RT Bryan Bulaga, and WR Randall Cobb. Houston should be busy early on freeing up much needed space (just $11M currently). They have plenty of needs (including QB), and not enough capital to work with as of today. Restructuring WR Andre Johnson, and trading/releasing CB Johnathan Joseph may be options. The Colts have made swift work in trimming their unnecessary pieces heading into 2015, and have now accumulated nearly $43M in cap space. They'll add another $3M to that by releasing the now non-guaranteed salary of RB Trent Richardson, and should look to sign back a chunk of their 15 unrestricted free agents. Oh to be the GM in Jacksonville this offseason, who currently has just under $60M cap dollars to "play with" - and that's after accounting for a $7.3M draft pool. They can add to that figure by cutting ties with RB Toby Gerhart and backup QB Chad Henne. We expect to see plenty of new faces in a Jaguars uniform in the coming months. Somewhat unexpectedly, the Chiefs are in poor shape heading into the 2015 league year. With less than $3M to work with Kansas City will need to be creative in the coming weeks to put themselves in a position to get better. Restructuring LB Tamba Hali, and cutting ties with underachieving WR Dwayne Bowe could be priorities. With just $1.8M in estimated space, change is coming in Miami. No team has more rumored "cap casualties" thus far than the Dolphins, who might seemingly cut ties with WRs Brian Hartline & Brandon Gibson, LBs Phillip Wheeler and Dannell Ellerbe, while also shopping the high-paid Mike Wallace. The Vikings will be a team to watch this offseason, as we await the future plans of RB Adrian Peterson. His outright release or trade would clear $13M in space, bringing their total space up to more than $30M. They can add even more to that by removing borderline pieces (QB Matt Cassel, G Charles Johnson, WR Greg Jennings). The Patriots -$4.7M in space is a bit deceiving, as it includes a $25M option for CB Darrelle Revis. The notable pending free agent list contains S Devin McCourty, RBs Shane Vereen/Steven Ridley, and K Stephen Gostkowski. Cutting ties with WR Danny Amendola can clear up to $4.5M in space. The Saints used every trick in the book to get themselves under the cap in 2014, and they're in just as much trouble so far in 2015. New Orleans currently sits at a whopping -$23.3M in the hole heading into the new league year. The cap mess probably means the end of Marques Colston in a Saints uniform. New York boasts just over $16M in space after draft allocations, which might make it difficult to bring back DE Jason Pierre-Paul (though the franchise tag appears to be in play). Restructuring QB Eli Manning by way of a long-term extension would be a nice way to free up some immediate room. The $48.3M in cap space might be one of the lone bright spots surrounding the Jets right now. With a $10.5M cap, WR Percy Harvin may be on the roster bubble as well, meaning New York has the money to buy/obtain pretty much anyone they wish this offseason. The Raiders can add to an already impressive $49.7M in cap space by cutting ties with RB Maurice Jones-Drew and QB Matt Schaub, though the latter could easily make the 2015 roster. Look for new head man Jack Del Rio to poach some of his former Broncos free agents this offseason. The Eagles are an interesting team right now. They may add a few pieces and try to push the current team into the postseason. They may also blow the thing up and start over this offseason, which may include cutting ties with highly-paid RB LeSean McCoy. The removal of longtime defensive coordinator could signal a rebuild of an aging defense in Pittsburgh. This may include the release of S Troy Polamalu, which can clear $6M in space (currently -$1.3M). San Diego carries $25M in space into the offseason, but holds a list of fairly notable pending free agents to lose as well. They can add another $5M in space by releasing the underachieving LB Jarret Johnson. Two years removed from the NFC Championship game, this team is now in total flux. The Niners only have around $1.5M in space when accounting for current contracts, dead cap, and projected draft pick compensation. They can begin to dig out by moving on from OLB Ahmad Brooks, restructuring/releasing WR Stevie Johnson, and restructuring the majority of QB Colin Kaepernick's $10.4M salary into signing bonus. The Seahawks have combined strong drafting with timely extensions to keep their cap tables flexible and well-structured. They'll carry $23.8M of space into an offseason that should include a monster extension for their worthy quarterback. The Rams have actually allocated themselves into cap trouble thus far for the 2015 season (currently an estimated $1.4M in the hole). They can free up more than $13M in space by cutting ties with C Scott Wells and OT Jake Long. The Bucs not only hold the first overall selection in the upcoming draft, but an additional $27.6M in cap space to work with as well. They've already released QB Josh McCown, and might soon do the same with DE Michael Johnson in the coming weeks, a move that would clear $2M more. Tennessee carries more than $39M in cap space to play with right now, and should add to that with the removal of S Michael Griffin ($4.5M in savings) and RB Shonn Greene ($3.35M in savings). Their 21 pending unrestricted free agents is tied for most in the league. The Redskins are in "decent" shape right now, with just north of $12M in estimated space to work with. They'll likely add to this by moving on from G Chris Chester ($4M in savings), DE Stephen Bowen ($5.5M in space), and possibly DB Tracy Porter ($2.8M in savings). It's likely the majority of their 14 UFAs walk this March. Follow Spotrac on Twitter, and keep up with even more on Facebook.